First, teach-in the normal switches and / or switching telegrams from xxter. This can be done using the normal teach-in process described in the manuals of the manufacturer and the default enOcean manual of xxter. Eltako and Opus greennet dimmers (the newer versions) also support switching feedback telegrams. This is useful for xxter. - Make sure the dim speed rotary is somewhere in the middle. - Turn the dim speed rotary anti-clockwise till the end (min) and back to the middle three times. - The LED will turn off after about 2 seconds, this confirms the setting. If the LED turns of immediately the settings is turned off, and you have to do these steps again. For some models these procedures might be different. 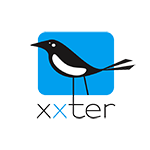 Start the configuration tool and connect to your xxter. After turning the dimmer on or off, a status switch command will be sent, and it will automatically appear in the configuration tool under the enOcean tab. Also add a new sending telegram a with RORG of 4 byte, a function of 38 Central command and a type of 02 Central dimming. Set the dimmer in the learn (teach-in) position and press the “Send learn telegram” button. Now add a dimmer action and use the telegrams learned to link to this dimmer.